The city of Paris is served by no less than two sizeable international air facilities - Roissy Charles de Gaulle (CDG) and Orly Airport (ORY), which are roughly 45 minutes and 35 minutes from the city centre, respectively. Roissy Charles de Gaulle Airport is to be found some 23 km / 14 miles to the north of Paris, alongside the suburbs of Goussainville and Mitry-Mory, while Orly Airport lies around 14 km / 9 miles to the south of the city, being just beyond the communes of L'Hay les Roses and Chevilly Larue. When combined, the annual passenger numbers for these air facilities are quite impressive, being just shy of 90 million. 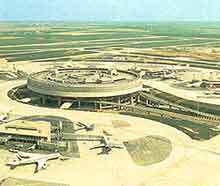 France's premier airport, Charles de Gaulle is called home by in excess of 100 different airlines. The most noteworthy of these include Air France, Air Méditerranée, Delta Air Lines, EasyJet, Europe Airpost, United Airlines and XL Airways France. On average, more than one million passengers now pass through CDG each week. Those renting a car will be able to drive into the city centre via either the A1 motorway or alternatively, the A3 motorway. The journey should take in the region of 40 minutes. Book your Paris CDG Car Rental here. This airport was actually the earliest in the whole of Europe to boast its very own integrated train system. The onsite RER rapid TGV train service heads into central Paris in approximately 40 minutes. Those looking to catch an onward train to Euro Disney will find that this leading theme park is only ten minutes away, while the city of Brussels is reachable within an hour by rail. Trains arrive and depart at least four times an hour, with additional trains being laid on during the busiest times. Line B links the Terminal 2 station with the centrally located Gare du Nord station, where you can make use of the city's extensive Metro underground network. Operated by Air France, regular airport buses head into central Paris roughly six times an hour, between 05:50 and 23:00. They connect the Place Charles de Gaulle, via Porte Maillot, departing from both Terminals 1 and 2 (a journey time of 40 minutes). Roissybus services are also to hand, travelling between the terminals and into the city centre's Opera district. These buses run at least four times an hour, from 06:00 to 22:30 (a journey time of 45 minutes). There are some further bus services travelling to and from Montparnasse, via the Gare de Lyon, between the hours of 07:00 and 21:30 (a journey time of 50 minutes). Taxis await their passengers outside of the terminals, while there are also a number of chauffeur-driven limousines available, should you prefer to travel in a little more style. Areas covered include the central departments of Hauts-de-Seine, Seine-Saint-Denis and Val-de-Marne, as well as the suburbs of Essonne, Seine-et-Marne, Val-d'Oise and Yvelines. The main taxi companies based here include ABC, Alpha, G7 Horizon, Les Taxis Bleus and Taxis G7, with the Versailles Exhibition Park being an especially popular onward destination, along with the attractions based in the La Défense district of Paris. Both the Stade de France stadium and the Villepinte Exhibition Park are also easy to reach by taxi from Roissy Charles de Gaulle Airport. Orly Airport resides on the southerly outskirts of Paris and boasts its own railway station, being connected to the city centre by RER Lines B and C. Based here are close to 40 different airlines, the most significant of which include Aigle Azur, Air Algérie, Air Caraibes Atlantique, Air France, Corsair International, EasyJet, Europe Airpost, Iberia , Royal Air Maroc, Transavia.com France and Vueling. 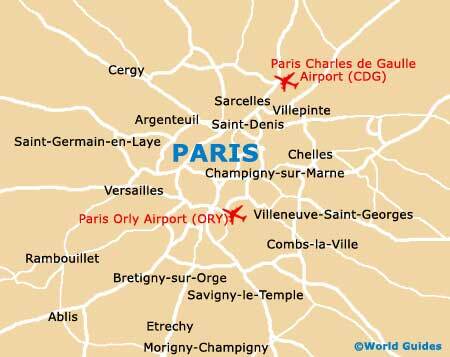 Those renting a car at Orly Airport can drive into Paris city centre in roughly 25 minutes, via the A6 motorway and the E50 (European Route E15). After crossing the River Seine, you can then simply follow the riverside Quai de Bercy and the Quai Henri IV, before reaching the Seine-Saint-Denis department and the iconic Notre Dame cathedral. Book your Paris ORY Car Rental here. The speedy Orlyval rail service runs between both of Orly's terminals, with a number of stops in the airport before it reaches the St. Antony station and the RER B railway line. Those planning to catch a train to the famous centrally located Gare du Nord should note that this journey will take some 30 minutes, or thereabouts. Alternatively, you can use the combined bus and train service to reach the RER C line. There are a number of different scheduled bus services connecting Orly with destinations around Paris. The Orlybus shuttle travels to and from the Place Denfert-Rochereau station, while Bus 183 connects the Porte de Choisy station, Bus 285 runs between the commune of Villejuif and the town Juvisy-sur-Orge, and Bus 292 links the Rungis International Market area. The Air France Coaches Line 1 runs to Montparnasse, with a journey time in the region of 30 minutes. A Jetbus service is also available and connects the Paris Metro Line 7 in roughly 15 minutes. Taxis queue up outside of the terminals and connect Paris city centre in just 25 minutes, although this time can vary slightly when traffic is heavy on the roads. Around the city, popular taxi destinations include those of the Notre Dame area, Porte Maillot, Porte de Versailles and the Parc des Expos, as well as the Gare de l'Est and Gare Austerlitz railway stations, and the hotels of Disneyland Paris.